PARIS, France, November 30, 2015 (ENS) – The United Nations’ two-week climate conference opened here today with a bouquet of speeches from world leaders, billions in funding pledges, and innovative ideas to help humanity battle climate change. 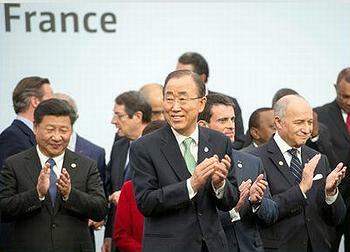 Opening the 21st Conference of the Parties (COP 21) to the United Nations Framework Convention on Climate Change, UN Secretary-General Ban Ki-moon addressed 143 heads of state and government and thousands of delegates assembled at the Paris–Le Bourget Airport, seven miles outside of Paris. 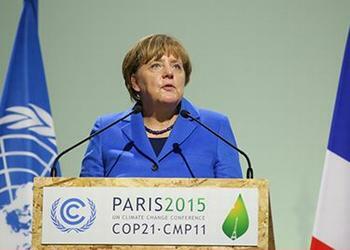 “Let us build a durable climate regime with clear rules of the road that all countries can agree to follow. Paris must mark a turning point. We need the world to know that we are headed to a low-emissions, climate-resilient future, and that there is no going back,” said the UN leader, who has criss-crossed the globe tirelessly for years to bring about an all-inclusive, legally-binding agreement to limit greenhouse gas emissions. France’s President François Hollande expressed gratitude for the friendship and support from around the world shown following the deadly November 13 terrorist attacks in Paris. 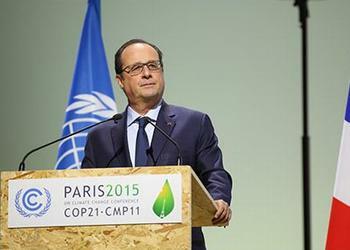 Hollande said COP21 will be a success if the outcome agreement determines a credible path to limit temperature rise below 2°C, or 1.5°C if possible. He stressed solidarity “so that no state can abstain from its commitments” expressed the hope that any agreement would mobilize all societies and sectors to act. “… for all the challenges we face, the growing threat of climate change could define the contours of this century more dramatically than any other. What should give us hope that this is a turning point, that this is the moment we finally determined we would save our planet, is the fact that our nations share a sense of urgency about this challenge and a growing realization that it is within our power to do something about it,” Obama said. “Our understanding of the ways human beings disrupt the climate advances by the day. Fourteen of the 15 warmest years on record have occurred since the year 2000 – and 2015 is on pace to be the warmest year of all. No nation – large or small, wealthy or poor – is immune to what this means,” he said. The United States and China, the world’s largest developed and developing countries, in total account for about 40 percent of all greenhouse gas emissions. 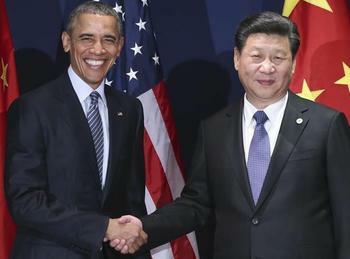 Presidents Xi and Obama met today on the sidelines of the conference. Xi told Obama that it is important for the two countries to continue their partnership to help the conference deliver the expected universal, legally-binding climate agreement to take effect in 2020, saying climate change is “an enormous challenge” faced by humankind. When the two leaders met in November 2014 in Beijing, they announced a partnership to tackle climate change and set greenhouse gas reduction targets. Two months ago, on Xi’s visit to Washington, the two leaders reaffirmed their bilateral cooperation on sustainable development and their transition to low-carbon energy and climate resilient economies. Merkel called for a binding review mechanism with a five-year cycle to begin in 2020 to ensure credibility and increased ambition. President Vladimir Putin said that Russia has not only met the requirements of the Kyoto Protocol, but has done even more. “We not only maintained the 1990 emission levels, we actually reduced them. At the same time,” he said, “we nearly doubled GDP during this period. In other words, it is possible to develop the economy while preserving the environment. 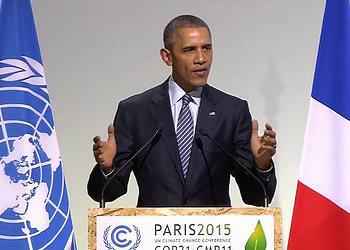 Presidents Putin and Obama also met on the COP21 sidelines. In addition to climate issues, they discussed the situations in Syria and in Ukraine. 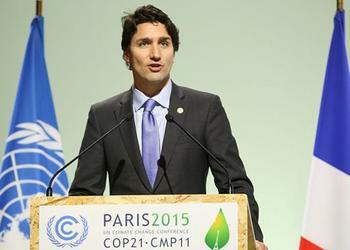 Trudeau’s predecessor, former Prime Minister Stephen Harper pulled Canada out of the Kyoto Protocol without fulfilling his commitments.